What are the needs of women? What is the role of the church in ministering to women? Am I qualified to lead women? Besides being filled with practical guidance, each of the ten chapters includes discussion questions and action steps for you and your team to complete. Five appendices provide additional information for you to work through with your team—to complete the path to healthy ministry to women! 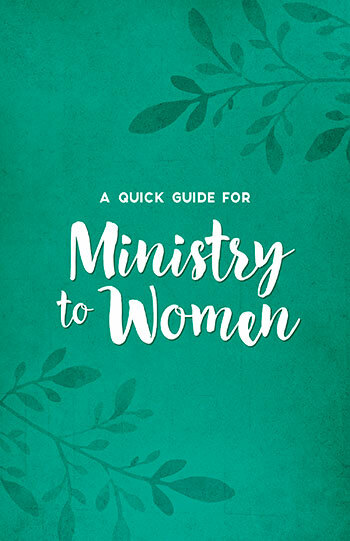 Share this guide with your team and inspire them to pursue their calling of ministry to women. Also available in Spanish, Guía práctica para el ministerio a las mujeres. 1. Who are the women we minister to? 2. Why should we minister specifically to women? 3. What are the needs of women? 4. What is the role of the church in ministering to women? 5. Am I qualified to lead women? 6. Where do I start? 7. What do I do? 8. How do I do it? 9. How can we empower women? 10. What is the desired outcome?